It’s official, I’m in hunt mode. There are 38 days between today and the new chapter of my life. Yes, in 38 days, my secondment into operational healthcare management will come to an end and the ‘prodigal daughter’ will return to a nursing role. I have learned a lot since I started in this ‘detour’ in May 2015. My learning journey has been astonishing . I have learned that I know more than I thought. I have learned that I can do more than I did. I have learned that the possibilities are immense and that going forward, I must never put limits on my capabilities. I have learned that I am enough. I am an inspirational leader and role model to many and even more to come. I have been reminded that I am a proud, passionate, compassionate nurse and will always be. 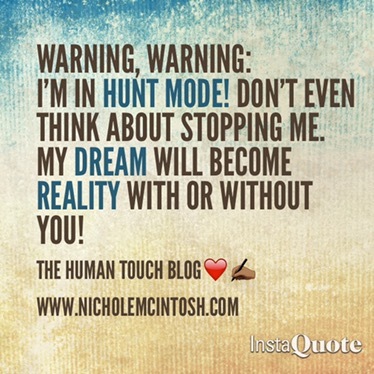 Yes, I’m in hunt mode and this means that I will allow nothing or no one to stand in the way of me fulfilling my potential. My secondment ends and then I begin the next professional chapter as Head of Nursing. It’s a challenge that I will meet with vigour and zeal. I am more experienced and confident now and I’ll use my new knowledge and skills to enrich the lives of patients and colleagues. I will seek out talented staff and mentor them to pass on what I have learned and encourage and empower them while they pursue their own goals. What are you hunting? I’d love to hear about it. Next Post Diversity in the NHS!